Emily B has been very ill in hospital over the last couple of weeks, and it was decided to send her an emergency quilt. This was a quilt made with squares from the Hearts Stitch-a-long. We understand that Emily is doing better now, but is still in hospital. Leroy and his mum Catherine appeared on the BBC 6 o'clock news last week in connection with an adoption story. Congrats to you guys on your national fame! We have received 32 squares this week! Many thanks to all those who stitched them! Thank you all for your cash/cheque/Paypal donations this week. We are currently channelling funds into purchasing quilting fabric from the USA which means donations will stretch a lot further than purchasing at high UK prices. Gaynor's friend in New York (Abby) has kindly agreed that Gaynor can have fabric shipped to her flat, ready for Gaynor to pick up when she visits at Easter. A little tower of boxes has already formed in Abby's flat! Katherine and Gaynor are in the process of sorting out the end of February deadline quilts (Isla, Amelia F, Harlum and Tahlia-Annikki). We have four quilters ready to quilt to take on a quilt each - just waiting for the last couple of squares to arrive. Carol P's cross stitch group has been in communication with Gaynor via post and they have already made a start on the squares for Olivia G and Jack G. Thank you, ladies! A lady called Gill saw Katherine in Popular Patchwork magazine this week and recognised her face - it turns out Gill is a quilter who also lives in Bourne and had seen Katherine around the village! Gill is very enthusiastic about LQUK and has already visited Katherine and taken away some Hearts Stitch-a-long squares to make an emergency quilt. New quilter Brenda is hard at work on the Butterflies and Dragonflies squares sent in by Jan - which will be another emergency quilt. We received this lovely photo of Faith L who has had some surgery on her toe this week - hope you are feeling better soon, Faith! Finally we have heard that Scott is back in hospital. We send our best wishes to all of the children who are poorly at the moment and hope they will be feeling better soon. We had a request this weekend to send Emily B an emergency quilt as she is very ill in hospital with severe breathing difficulties at the moment. As Emily is 17, she has been placed on an adult ward, which is not decorated in a friendly way as the children's wards are, and her mum requested an emergency quilt to make her feel more at home in hospital. We will be sending Emily the Hearts quilt which was quilted by Rebecca a couple of months ago. Leon's quilt was opened and closed. Adam G's quilt was opened and closed. Mikey H's quilt was opened and closed. Thank you to everyone who has sent in donations this week! Also, we received our first Gift Aid payment from HMRC of Â£161.47 which is very good indeed! Thanks to all who took the time to complete and send in the Gift Aid forms! A fairly quiet week for once! Gaynor has started to line up quilters for Isla's quilt, Amelia F's quilt, Harlum's quilt and Tahlia-Annikki's quilt. We have been contacted by a cross-stitch group from Leek in Staffordshire who would like to take on two quilts entirely, as a project for their group. They will cross-stitch the squares, provide the materials and Carol P will do the quilting. The group will be working on quilts for Olivia G and Jack G. Olivia and Jack are siblings of Finley G and suffer from the same condition. 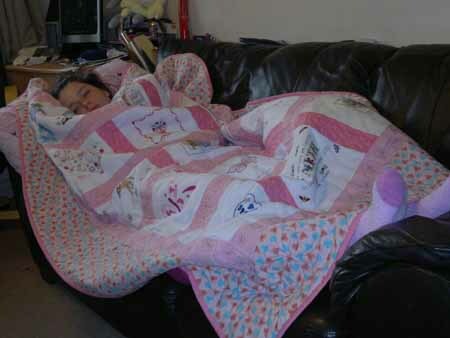 We have also heard that Seraphina who received a quilt from us in 2011 is very poorly at the moment, and we ask you to keep her in your thoughts. Jamie J's quilt was closed. If your stitchers would like to contact us direct at sales@katzxstitch.co.uk quoting LoveQuiltsUK we'll gladly offer 1m x 1.5m of white/antique white Aida for Â£9.60 + P&P. P&P on a metre is Â£3.00 first class or Â£2.75 second class (based on Royal Mail rates for up to 500g small packet). Indeed we'd be able to supply up to 40 skeins of threads with no additional P&P cost. We could also cut 13" x 13" squares for Â£1.20 + P&P (3 squares would be Â£1.00 P&P first class, 8 would be Â£1.40). These prices are based on direct PayPal invoicing (cheques and bank transfer would be a further saving). In due course, I'll look to set something up on our website. This is a very good offer and we hope many of our UK stitchers will be able to take advantage of it. Thank you, Rachael! (See Fabric page for details) Thank you very much, ladies!